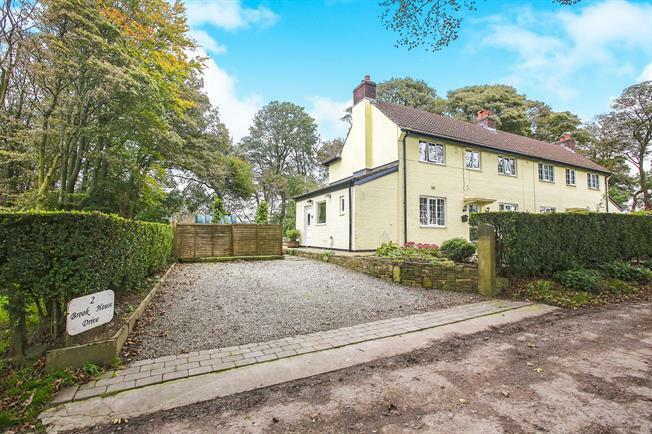 4 Bedroom Semi Detached House For Sale in Buxton for Offers Over £495,000. This superbly appointed semi-detached property enjoys a semi-rural setting and is situated on a particularly spacious plot that includes outbuildings and a static home. The main accommodation includes an entrance hall, a bright and spacious living room, a dining room with wood burner, a large open plan dining kitchen, a utility, a laundry room and a cloaks/WC to he ground floor, whilst to the first floor there are four well proportioned bedrooms and a bathroom. Other features include oil fired central heating and uPVC double glazing throughout. Outside there is an abundance of off road parking and the well tended main gardens include a large patio and a sweeping lawn at the rear, whilst to the side at the property there is a wild woodland garden which also houses the static home and a triple garage. Viewing is absolutely essential in order to fully appreciate everything that this unique property has to offer. UPVC part double glazed entrance door, under-stairs storage cupboard, spindle staircase to first floor landing, radiator and doors to the dining room and the kitchen. UPVC double glazed double doors opening out into the rear garden, uPVC double glazed window to side, radiator, wall lights and downlights. Fitted with base, wall and island units surmounted by roll edge worktops and with an inset one and a half bowl sink unit with mixer tap and drainer, an integrated eye level electric oven and a separate hob with extractor over, plus space for a large fridge freezer. UPVC double glazed windows to front and rear, a tiled floor, a beamed ceiling and a double radiator. Doors to living room and utility room. UPVC part double glazed door to side, a uPVC double glazed window to side, wall and base unit with roll top work surface over and a door to a laundry room. Plumbed for washing machine, space for dryer. UPVC double glazed window to side. Comprising a close coupled WC, a wall mounted wash hand basin and with a frosted uPVC double glazed window to the rear. UPVC double glazed window to front, radiator and a built in cabin bed. Comprising a panelled bath with mixer tap and shower over, a pedestal wash hand basin and a close coupled WC. Heated towel rail, tiled walls and floor, downlights and a frosted uPVC double glazed window to the rear.